The occasional cough from Fido is normal and likely nothing to worry about, but if your pooch is coughing incessantly, it's time to visit the vet to determine the cause. Your vet may prescribe medication to treat whatever is causing your pup's coughing and possibly prescribe a cough suppressant to help provide him with some relief. You also can use a few natural remedies to alleviate his cough while he recuperates. Several illnesses can cause your pooch to cough incessantly, including the most common, which is kennel cough. Kennel cough, also known as tracheobronchitis, is a highly contagious respiratory disease that causes a dry, hacking or honk-like cough. Lung problems, foreign bodies in the lungs, pneumonia, bronchitis and trachea problems all can result in your pup's frequent coughs. Other respiratory diseases caused by bacteria, fungi and parasites can be the cause of your pup's persistent cough. More serious conditions such as heartworm infections and heart disease can lead to coughing, especially after exercise. Tracheal collapse, a condition most commonly found in toy and miniature breeds of dogs, also can result in frequent coughing. If your pup's cough is persistent, doesn't go away within a week or he develops other symptoms such as a fever or lack of appetite, bring him to the vet for a checkup. Your vet can diagnose the cause of your pup's condition through a variety of tests, including blood and urine tests, X-rays and CT scans. Once she determines the cause of your pup's coughing, she can develop a treatment plan. She may prescribe a cough suppressant for your pooch during his recovery if he has a dry cough, but not if he has a moist one. Cough suppressants can impede the healing process if your pup's coughing is moist and productive. Productive coughing is necessary for your pooch to expel any excess mucus from his lungs and airways. To provide your pup with some relief from his frequent dry coughing during his recovery, give him a little bit of honey a few times a day to help sooth his throat and quiet his cough, recommends the Whole Dog Journal. Honey is sweet, so your pup should enjoy eating it. Coconut oil also may help with his cough and won't hurt your pooch. Consult with your vet about what amounts of honey or coconut oil she thinks are appropriate for your particular pooch. A vaporizer or diffuser, filled with a few drops of essential oils such as eucalyptus and lavender may help relieve your pup's coughing naturally and help open his airways if he's a bit congested. Steam from a humidifier or nebulizer also can loosen the mucus in your pup's lungs, providing him with some relief from his coughing and make his wet coughs more productive. Simply masking your pup's cough with a cough suppressant isn't a solution to whatever the underlying cause of the coughing is. 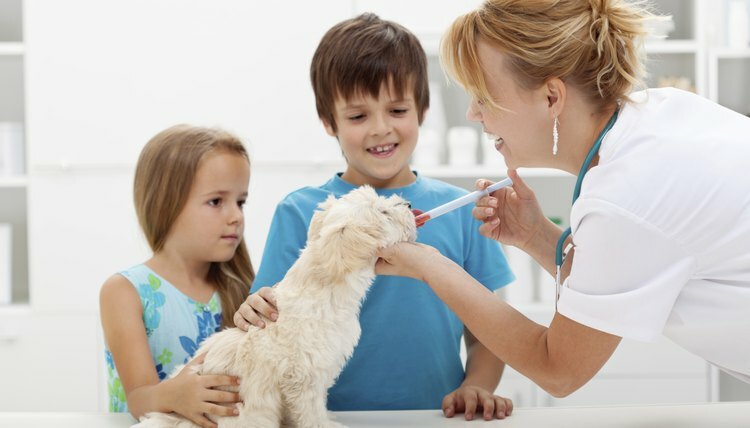 After treating the cause of the cough, your vet will only prescribe an over-the-counter cough suppressant such as dextromethorphan for your pup if she thinks it is warranted. This cough suppressant isn't approved by the U.S. Food and Drug Administration for use in animals, but is frequently prescribed "off-label" for dry coughs and chronic bronchitis in dogs and cats. Never give other human cough medications containing acetaminophen, alcohol or caffeine to your pup as these ingredients are toxic to dogs, warns PetEducation.com.